This year I had the chance of joining the FOSDEM conference again and as always it was great to meet up with other FLOSS enthusiasts. It was also a good chance to meet with some Xfce folks (Harald, Florian) and sponsors (Volkan) and finally it was a good time to hack on stuff. This year I sat down with Florian in the evenings and invested some time into colord integration. colord is – in short – a system service that enables you to manage, install and generate color profiles to accurately color manage input (webcams, scanners) and output devices (displays, printers). colord itself comes only with a commandline tool (colormgr), which is not great in terms of discoverability and usability. 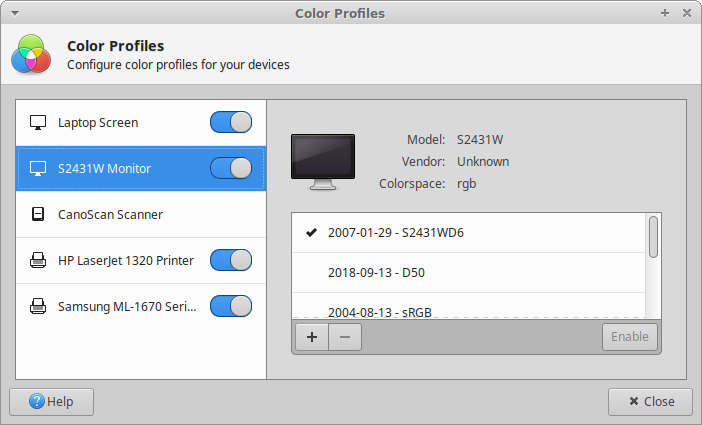 Both Gnome and KDE have already integrated colord support into both their settings dialogs and settings daemons, but in Xfce there was no easy way to achieve a color-managed session. In order to enable people to set up color management I decided to start with the frontend. In theory you can already get a working setup in Xfce by relying on cupsd (for printers), saned (for scanners) and xiccd (for displays) and handling colord through the colormgr commandline tool. What we managed at FOSDEM was still pretty rough but I took a few days (read: nights) and polished the dialog so it became more and more user friendly and the final product can be seen in the screenshot above. “So, that’s great – what else is missing?” I hear you ask. That’s quite simple: In short, we need to integrate the backend for colord into xfsettingsd so we don’t have to rely on xiccd anymore. While it seems to run stable here for me it’s yet another daemon, so xfsettingsd integration would definitely be a plus. The cool thing about the frontend is however that everyone can already use it for printers and scanners, because those are natively supported already. “When can I have this?” may be your reasonable follow-up question. I’m still ironing out small kinks (not too many hopefully) and I still have quite a bit of code cleanup ahead of me, but my current plan is to get this feature merged before we release Xfce 4.14, so the likelihood of it showing up in the next (or subsequent) development release of xfce4-settings is high. It then still depends on your Linux distribution whether the colord integration is included, because it’s a compile-time option (not every user/distro may want having to pull in colord, as it’s yet another service that’s running all the time). Finally I’m not sure I’ll have time for the backend part in the very near future, so we’ll have to see about that. Luckily the dialog is useful even as it is. In the meantime you can support me through friendly words, posting a bug bounty on colord backend integration or you can do some testing and provide me with feedback through checking out my branch, currently hosted on GitHub. After patching up xfce4-settings and finishing the “primary display” story with the patches against xfdesktop I decided to turn to the panel and continue making it 4.14-ready. Next stop: xfce4-panel 4.13.4. A few things had bugged me there for a while, for one the lack of consistent icon sizing. What the new “icon size” property I implemented gives you is a way to set one icon size per panel instance, so you can have e.g. a 60px panel with 48px icons, or a 32px panel with 16px icons (which gives the icons more padding/breathing room visually). If you set icon sizing to “automatic” (the default value) the panel will try to calculate meaningful sizes for your icons based on the panel size, as before. So while the panel’s API call xfce_panel_plugin_get_icon_size has been around for a while in the 4.13 cycle, I extended this now to also handle fixed sizes set by the user per panel instance. I highly encourage every plugin developer/maintainer to use the API call mentioned above in their panel instead of custom size calculations, as it will lead to consistent sizing of all panel plugins per panel. You can find examples of its usage here (panel core plugin) and here (external plugin). Luckily I’m not the only one currently hacking away on the panel. So another thing Alistair was fixing is the menu positioning on the panel’s core plugins. This is however a fix that all plugin developers/maintainers should pull in against their plugin. It leads to consistent positioning of the plugin menus in general and in overflow situations. You can find a good example for the correct usage of gtk_menu_popup_at_widget (which is used for showing plugin and other menus) here. After deciding to use the panel’s “Window Buttons” (aka “tasklist”) plugin more to test its stability I managed to fix a few bugs in window grouping. For instance the buttons of grouped windows now support the “active”, “minimized” and “urgent/blinking” states and are consequently more consistent with ungrouped buttons. I also dug a little into libwnck – which we rely on for the app icons and the grouping in tasklist – and was able to get us high resolution application icons. While it worked fine for a single panel instance or for multiple tasklist instances with the same icon sizes, adding multiple tasklist plugins with different icon sizes led libwnck into a signal loop. Due to this unfortunate bug (or: mis-implementation) I had to revert this commit/feature. Ultimately the issue has to be resolved in libwnck – or alternatively we may come up with a separate tasklist-based plugin that relies on bamf instead of libwnck (future plan). Apart from the things mentioned above, I have also introduced some new CSS style classes which can be used by themes/themers. To be more concrete, for orientation-specific theming (e.g. margins or paddings) you can now use .xfce4-panel.horizontal and .xfce4-panel.vertical. For the tasklist I have introduced a group-buttons class which you can use to visually distinguish single-window buttons from group-buttons. This is useful as the behavior of those two buttons is different (group buttons pop up a menu with all associated windows, single-window buttons focus the window in question). Finally, we also managed to fix a lot of bugs and deprecations in the code (thanks Alistair!). As some may have noticed I have lately patched “Primary Display” support into a few of our components. It all started with the display settings dialog… But let me start right at the beginning. “Primary” is a setting of X11’s RandR extension that “is expected to be used by desktop environments to mark the screen that should hold the primary menu bar or panel” (quoted from the specification). 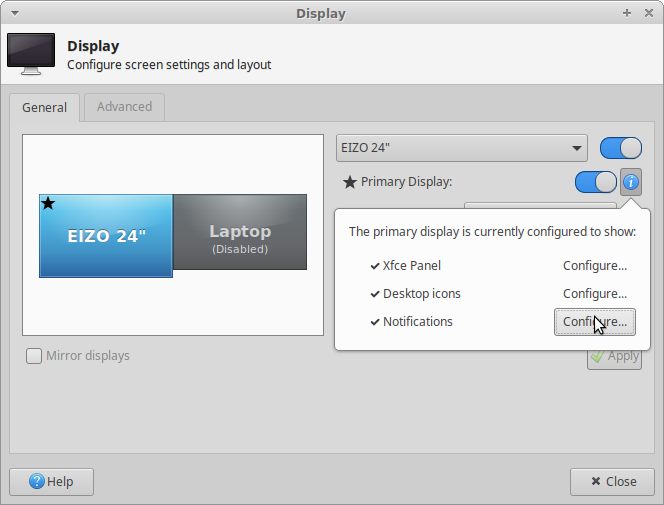 So in short: the “Primary Display” should hold your panels, your desktop icons, your notifications, potentially your presenter’s screen (if you use LibreOffice) etc. in a multi-display setup. In 2016 I started by introducing a hidden setting in xfce4-notifyd. This meant your notifications wouldn’t pop up during presentations on external displays anymore (because the default setting before was to follow the mouse pointer’s location). I personally needed/wanted this and it felt like an easy fix. In 2017 I added the feature to xfce4-panel. Before that you had to either hard-code the location of the panels or use the “Automatic” setting, which always puts your panels at the left top part of the screen (x=0, y=0). 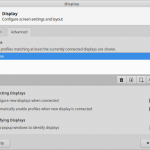 In combination with the display settings option this provided an easy way of moving the panel around and keeping it on certain displays even when connecting new additional ones. In late 2018 I started working on the big missing piece of the puzzle, which is xfdesktop. At the time of writing, my patches are still in review in this bugreport (testing welcome! ), but things work ok or at least well enough to give me hope that we will see this in the next development release. In parallel to the xfdesktop patch I also picked up the display settings dialog again after gathering some input from friends at work and decided to pull in all the information about the usage and configuration of the “Primary Display”, as its settings are spread across several components and dialogs. The point of this popover is to show the current configuration status as well as adding a shorthand for accessing all those settings dialogs. I also went with a new way of highlighting which display is configured as “Primary Display” that is hopefully more easily understandable than the panel I added in the 4.13.5 release. The star is shown both in the displays widget as well as in the properties list of each display, so users can easily visually match which display is primary and what that means. After quite a bit of development time I’m happy to announce the next development point release of xfce4-settings in the 4.13 series. There are many fixes in this release – most visibly also UI improvements. This includes consistent padding/margin etc across all dialogs as well as a restored hover-effect in the Settings Manager. Finally both the advanced (fake panel as indicator for primary displays, re-arranged settings and distinct advanced tab) and the minimal display dialog (new icons, improved strings) received a facelift. This new feature allows you to store one or more profiles for a particular display configuration that you may be using. In order to uniquely identify single displays we rely on the so-called EDID (Extended Display Identification Data) so a profile becomes a combination of those unique EDIDs. As already mentioned, you can store multiple profiles per setup to cover use-cases like rotating single screens or when enabling/disabling or re-arranging certain screens may be necessary. For instance in office situations where you switch a lot between one or multiple docking stations, projectors and other external devices, this feature will allow you to do so with ease. Every scenario just has to be configured and saved once. It is important to note that the list of available profiles is always filtered based on the currently connected displays. To be exact: this means that at least the currently connected displays need to be part of the profile definition for the profile to appear in the list. In turn this also means that if you only have your internal laptop display connected, you will see all profiles because your laptop display will always be part of every profile (even if it is disabled!). To make the deal a little sweeter I implemented auto-applying of profiles when new displays are connected. 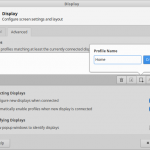 This is an optional feature that automatically enables the first – if there are multiple defined for the set of currently connected displays – matching profile. This action is also triggered if you open the minimal dialog, giving you a shortcut to auto-apply profiles. What is not yet implemented is profile-awareness for xfsettingsd. So the settings daemon does not automatically enable a profile if you simply start your session, but previously worked in a different display setup. However, this is a point I would like to address in a future release. In the meantime, enjoy xfce4-settings 4.13.5! Most of this post is fairly old news, but still worth to be mentioned. I have read your comments and bugreports and have already been working towards some further improvements of notifyd, so I guess 0.4.1 is around the corner. Finally, here goes the “historic news”. After a longer waiting time I pushed out another development release of the panel. This one includes among as major change the port to GDBus, which was done by Ali. This means the panel now depends on xfconf 4.13 – recommended is at least 4.13.3 – and is not compatible anymore with xfconf 4.12. A lot of bugfixes and translation updates accumulated over the last months since 4.13.0, the most prominent one is the fix of drag and drop (one of the bigger known regressions of the Gtk+3 port) thanks to Peter. A nice new improvement is the re-ordering of systray items, which was implemented by Viktor. We’ve had a lot of problems with keyboard shortcuts not working reliably with the panel plugin and systray version of clipman so Mike rolled up his sleeves and ported both to GtkApplication. I haven’t had a problem with my keyboard shortcuts since! This release features some small improvements including slimmer CSD/headerbars to save some vertical pixels, initial support for Xfdesktop 4.13 to help all testers of Xfce’s development releases and finally a fix for message dialog buttons. I have since then been working towards supporting Thunar’s Gtk+3 port better in Greybird, which will be included in the next release. The first Gtk+3 release of xfce4-panel is out! After a looong waiting time – the original port of the panel was first kicked off in March 2013 by Nick – the first development release of the xfce4-panel is out and I am happy to say it is usable! 🙂 There are however some regressions and of course a lot of potential bugs that simply haven’t been uncovered because of the limited usage and testing so far (I guess I haven’t gone through all possible kinds of panel setups). I know this is very boring, but the Gtk+3 version of the panel is on par with 4.12.1. Most of the functionality is there (see regressions and known issues), but no dramatic new features were introduced (apart from what the Gtk+3 toolkit brings to the table itself). One notable feature that people have also been requesting for a while – in fact yours truly originally reported the bug – is support for RandR’s “primary monitor” feature. 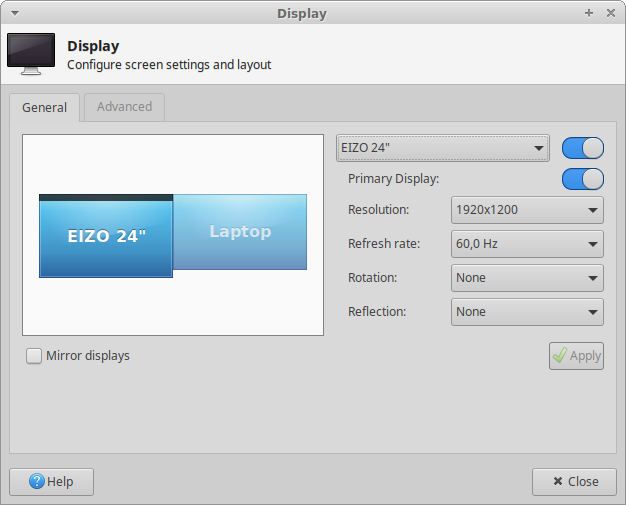 This means the panel will not stay on the left-most monitor by default but jump to the monitor that you define as “primary” in xfce4-settings Display dialogue. There is also one deprecation that is worth mentioning. While the panel relied on xfce_panel_image in Gtk+2 (i.e. pixbuf drawing and scaling) we decided to deprecate this approach in favor of using the toolkit’s features directly (which is now possible more efficiently with Gtk+3). The newly added xfce_panel_plugin_get_icon_size relies on GtkImage directly and which introduces defined, meaningful icon size-steps to avoid fuzzy icons in the panel. I have already added some basic theming for the panel to Greybird and I hope this will help others. I’ve also noticed that the GtkCalendar widget in Gtk+3 is visually broken (actually also codewise really terrible, and likely therefore unmaintained) and made some effort to improve that in Greybird. Well, there are still a lot of things to do. The top two of the todo list for the panel are of course fixing all known and not yet reported bugs as well as cleaning up more deprecations (currently your terminal’s backlog is filled with warnings when running make, which makes it hard to distinguish the meaningful from the meaningless information). Do some testing, either by using something like VirtualBox or xfce-test or use a distribution that is brave enough to package the panel (I presume we will see it in some Ubuntu PPA in the near future). Set the panel up your way and just use it and hopefully we will manage to cover all existing use-cases and have them working in 4.14 as well. Please report bugs against the 4.13.0 version of the panel so that we can get a clean todo list for the next development release! Finally let me give a big shout-out to everyone involved in the port – more people than I could meaningfully mention here. The translators, everybody who reported bugs or did testing so far and of course the developers who invested a lot of their free time and energy in this enterprise. Author Simon SteinbeißPosted on May 24, 2017 December 12, 2017 Categories News, Xfce19 Comments on The first Gtk+3 release of xfce4-panel is out! Xfce – like many other open source projects – is not exactly following a test-driven development workflow. I would argue that we need a slight mindset change here plus we need some (standardized) infrastructure to make testing easier for people who want to get involved. Luckily what we have been waiting for in terms of the latter is already here! 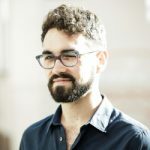 xfce-test is a Docker-based setup built by Florian which enables anyone to quickly spin up a container (based on Xubuntu 17.04 for now) with some components integrated from Git master, e.g. the Gtk3 panel. The great thing is it does not create the overhead of a real virtual machine for a tester but instead stays in the lightweight world of containers. This also makes it easy for everyone to adapt and rebuild the container and to create a reproducible environment that can be shared. Just check out these few steps to try it in action – it really does all the heavy lifting for you! Kudos also go out to the Gnome team for setting up a real nice contribution workflow for their community. We should really strive to reach that level at some point! And another bugfix release for xfce4-notifyd is out! The best part about this is that apart from code-review there was nothing for me to do to get there! So a big shout-out goes to both Mattias and Igor for fixing some of my – slowly but surely traditional – shortcomings (memleaks here we go again!). So there are also new releases out for Greybird, and not a bad ones I may add. On the feature side I added a preliminary version of a dark theme, which I hope will please some of the Gnome users of this theme. Furthermore I did some polishing on making GtkPopover and Headerbar buttons more integrated and tight. 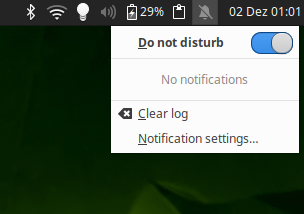 Finally some fixes went into Nautilus notifications, the xfce4-notifyd theme and GtkCalendar looks acceptable at last (which makes the Gtk3 version of the panel usable)! So all in all two micro-releases worth upgrading to! This release adds support for the new icon names of Gnome 3.24. I also pulled in several icons from upstream elementary, especially updated mimetypes (thanks Dan!) plus I added support for Pantheon Photos. Finally I added more sizes to some of the icons, ridding the theme of some inconsistencies. As hinted at in the previous installment of “Releases, releases, releases!” I’ve been pouring quite some time into getting xfce4-panel close to a first 4.13 development release. This should help testers to get a packaged up stable point of reference and it should also help us to track the remaining issues in our issue tracker like normal human beings instead of collecting everything in the wiki roadmap page. So while there are still some issues remaining (one of the more prominent disfunctions is broken drag-and-drop in certain contexts) I use the panel on a daily basis and it hasn’t crashed upon me once and does pretty much what it should – even with Gtk2 plugins in it (nnnice! ).